"Glory" is a song performed by American rapper Common and American singer John Legend. It was written by John Legend, Common, and Rhymefest. The song was released on December 11, 2014 by Columbia Records as the theme song from the 2014 film Selma, which portrays the 1965 Selma to Montgomery marches. Common also co-starred as Civil Rights Movement leader James Bevel in Selma. This updated edition features 14 hits from this Grammy Award winning R&B vocalist for piano, voice and guitar. Songs include: All of Me - Everybody Knows - Glory - Green Light - Love Me Now - Ordinary People - Save Room - Slow Dance - So High - Start a Fire - Stay with You - Tonight (Best You Ever Had) - Who Do We Think We Are - You and I (Nobody in the World). The dramatic song by American rap artist and actor Common and singer/songwriter John Legend is featured in the historical film drama Selma, based on the 1965 Selma to Montgomery voting rights marches led by Martin Luther King and other civil rights leaders of the time. A powerful learning opportunity for a new generation! Winner of a 2015 Oscar Award, this inspirational song speaks of hope and looks to the future for healing in the midst of great division. 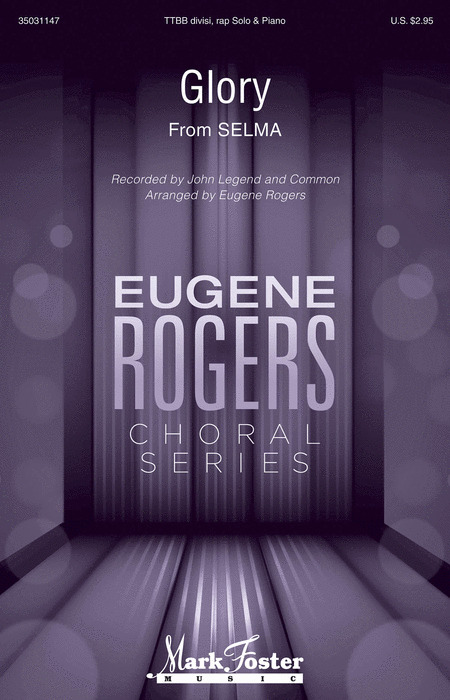 Eugene's gospel-like setting offers comfort to the community and motivates individuals to keep working for a better tomorrow. Through the voice of a powerful soloist, male chorus and spoken word artists, the message of unity and hope is left ringing in our ears. This is a joyful and celebratory anthem that is perfect for worship or concert. The text is inspired by the writings of Martin Luther and celebrates the gift and healing power of music.